The Ministry of Unification is considering forming a task force team to respond to the possible eruption of Mount Baekdu, a volcano on the border between China and North Korea. “As the possibility of a Baekdu eruption is raised by many academics and experts, we are considering setting up a task force team regarding the issue,” a ministry official said Tuesday. In order to come up with effective measures, critics here said, the government needs to work together with the North Korean government based on the improved relationship between the two Koreas. Some experts here and abroad have recently warned of the possible eruption of the dormant Baekdu in the near future. Yoon Sung-hyo, geology professor of Pusan National University, said during an academic conference in June that a Baekdu eruption could happen in 2014 or 2015, citing the opinions of Chinese experts. “I cannot be sure about the exact dateline due to a lack of accessible data. However, clear signs are being witnessed that the mountain may erupt in the near future,” he said. According to him, minor tremors have begun to occur 10 times more frequently, close to the mountain peak since 2002 when a magnitude-7.3 earthquake rattled China’s Jilin province. 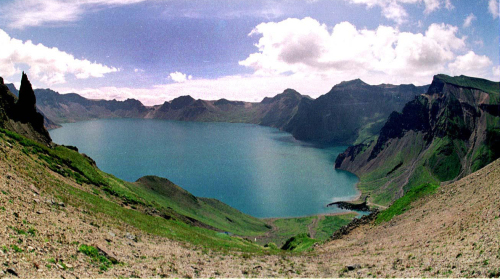 In February this year, another strong quake measuring 6.9 on the Richter scale hit the nearby area, probably agitating the magma fluid concentrated below Cheonji lake at Baekdu’s peak. “If the coming eruption is the similar to the previous massive one 1,000 years ago, the consequence could be 1,000 times the recent Iceland eruption,” Yoon said. In its 2010 macroeconomic report, published in October, the Ministry of Strategy and Finance also predicted that if Mount Baekdu erupted in winter, volcanic ash could disrupt imports and exports by air and cause a drop in temperatures, leading to soaring food prices.